1. Left-click the red object and drag a velocity (red) vector out from it. If unsuccessful, press "Reset" and try again. 2. Left-click the red object again and drag an acceleration (blue) vector out from it. 3. When the red object is not moving, the two vectors can be modified by left-dragging their heads. 4. Translate the whole system by right-dragging (or control-dragging) the red object. 5. After the velocity and acceleration are created, select the force that acts on the red object. 6. When the "central force" is selected, a gray dot will appear. This is the centre of the central force. You can drag the gray dot to a new position. 7. To refresh the black dots on the locus, uncleck "Show locus" and check it again. In central force motion, the orbits are closed only for inverse square law and Hooke's law. 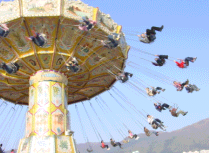 The horizontal component of the tension in the rope provides the centripetal force. The horizontal component of the lifting force acting on the wings of an aeroplane provides the centripetal force for its turn.